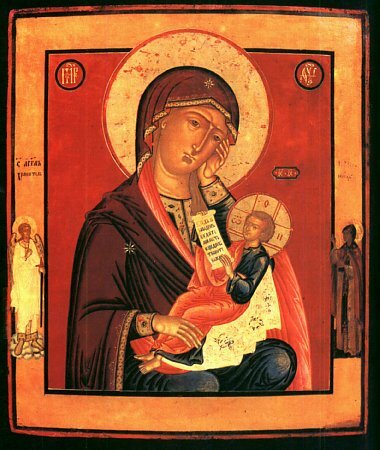 The Icon of the Mother of God, named "Alleviatrix of my Grief"
The Icon of the Mother of God, named "Alleviatrix of my Grief", was glorified at Moscow by many miracles in the second half of the XVIII Century, and particularly during a time of plague in the year 1771. The icon was brought to Moscow by Cossacks in 1640 during the reign Mikhail Feodorovich (1613-1645) and placed in a temple of Sainted Nicholas at Pupyshakh and Sadovnikakh. One time, likely following a conflagration and repeated rebuilding of the temple they forgot about the icon, and it was taken out and put in a bell-tower in great carelessness. But the abundant mercies, manifest through it by the Mother of God, compelled them to recollect their forgetfulness of the holy icon and to remove it into a proper place in the church, in which later a chapel was built in its honour. The celebration of the wonderworking icon, made annually on 25 January, was established in the year 1760 in memory of the healing of a sick woman, who had been granted a vision of the holy image, and was healed after a molieben service before it on 25 January in the church of Saint Nicholas at Pupyshakh street in Moscow. To this period are attributed the compilation to it of services and an akathist. Venerable copies of the Icon of the Mother of God, named "Alleviatrix of my Grief", are found in may of the churches of Moscow and other cities.